The dark middle chapter is something of a cliché these days. You’ll hear about the concept when talking about any movie or book trilogy. Sequels are often known for taking beloved characters from the first part of the trilogy and dragging them down a hole of struggle and strife, subverting the expectation already established that these heroes can overcome anything. While this formula has been used ad nauseam in film, it’s relatively unused in games where planning a trilogy is a very different task. In fact it’s rare for games to know for certain they’ll be getting a trilogy, so most game sequels are usually standalone entities. Maybe they’ll give you an Easter egg at the end to wet your appetite for more, but most sequels try to stand on their own. This is what makes The Banner Saga 2 different than your run-of-the-mill video game sequel. While the original game from Stoic Studio was a complete story, culminating in a climax filled with pathos, The Banner Saga 2 relies on the emotions, connections, and - most importantly - the story built up during the first outing. There’s also no satisfying conclusion to The Banner Saga 2. Instead of a winner-take-all battle that offers resolution, this sequel continues to break its already-fragmented world. Things are bad and they just keep getting worse. Players begin the game as either Rook or Alette, depending upon the choices from the first game. While I don’t regret any of the choices I made in The Banner Saga, I was a little bummed to be playing with Rook. I thought missing Alette, one of my favorite characters from the first game, would sour the experience but instead I found it as a driving force for Rook’s character. Having Alette at Rook’s side in the first game gave me a clearer sense of right and wrong. There’s a paternal instinct that made me want to be a better person for this digital daughter. With her death haunting Rook at the beginning of the game, the choices suddenly become more grey and I was less interested in saving my clan than I was in exacting revenge on those who took Alette from me. The game’s writing is impressive in how it guides your emotions. The dialogue options have less to do with directing the narrative and more to do with reflecting on how the game is making you feel. To some players, Alette’s death (or Rook’s, again, depending on choices) might not be as impacting, and the game allows your character to show both ends of the spectrum. The first half of the main character’s narrative arc is almost a breaking of the fourth wall as the game attempts to see if there is any heart-felt material to mine in wake of the first entry’s ending. Much like in The Banner Saga, you aren’t just leading Rook or Alette’s clan. The game quickly divides the clan and players also assume control of Bolverk, a Varl mercenary who was introduced at the very end of the first game. Here players can really indulge in their sadistic side as Bolverk’s character is given the opportunity - and motivation - to do some pretty awful things. This is the dark middle chapter, remember? Bolverk is the embodiment of the nastier tone as he leads his team of mercenaries (called The Ravens) on a bloody journey with a task given to him from the magic-wielding Valka, Juno. Bolverk is the perfect character to play when juxtaposed against Rook or Alette. He doesn’t care about civilians, he’s quick to engage in combat - he’s the bloody, ruthless commander that is the exact opposite of the leaders we’ve played thus far in the series. 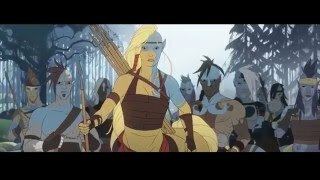 The Banner Saga 2 not only gives us more variety in characters, but it also continues to flesh out one of the most interesting worlds in video games, adding new locations, races, and politics. All of these new elements of course tie back into the decisions you’ll be making. Do you want to take on the feared and alien horseborn as allies? How much do you trust the skeezy governor who’s traveling with you? With each new element comes a decision to make, and they aren’t the black-and-white variety. Mechanically, The Banner Saga 2 is very similar to the first entry. When you’re not enjoying the well-written story and making choices for your clan, you’ll be fighting in the well-crafted strategic combat or managing the journey of your clan in an Oregon Trail-esque screen. The game lets you import your save from The Banner Saga, including your stats and levels. But much like in the previous game, you can promote your heroes to new levels once they’ve killed enough enemies, customize their stats with each promotion, and equip special items that will help in combat. The combat itself feels less difficult compared to the previous game. I had to try a couple battles a second time, but for the most part I didn’t find much challenge this time around - and I certainly wasn’t as hesitant to start a fight as I was in the last entry. This might be in-part to how familiar everything feels. There are some new enemies to keep things interesting, like the four-legged Dredge that can turn invisible and ambush your movements. There are also upgrades to regular enemies, like the Slag, who can now summon these four-legged foes. Much like the last game, some encounters have special objectives. Unfortunately, these objectives aren’t always well communicated. There were times when the length of a fight would take far too long just because I was unsure of how to resolve it. A couple of times these misunderstandings led to defeats that altered the course of the narrative. I also didn’t find the clan management to be as challenging as the first game. On regular difficulty I started with a thirty day supply of food and while some of it was lost I never felt like I was in the dire conditions I had experienced in the original trek. This might be in part to the clansmen becoming useful. Clansmen will now forage for food, pulling more than their fair share instead of being dead weight. Now fighters become the burden as they consume more food than clansmen and don’t contribute. You can also now train clansmen to become fighters, ballooning out your army. The consequence of such a strategy is a clan filled with fighters who will consume more food and contribute none. That being said, you can’t strictly rely on clansmen because you’ll need fighters when you inevitably get tangled up in battle. The events during the journey are still the most interesting part. Things might seem a little less dire, but the choices made in this game are not always about survival. The unity of the clan and your authority as leader are what’s really at stake. So even if you’re cruising along with plenty of food, there are still lots of tough decisions along the way. The art of The Banner Saga 2 continues to be drop-dead gorgeous, and the sequel is maybe even more beautiful. The best quality to The Banner Saga is how it approaches fantasy tropes in unconventional ways. When you journey through a legendary forest, instead of filling the screen with greenery, the game indulges in purples, pinks, and sunset orange. Instead of the underground tunnels feeling oppressive, they expand out in great caverns. There’s also more animated cutscenes that show off this amazing artwork. It’s an impressive step forward presentation-wise. Austin Wintory returns as the composer, continuing his fine work from the first game. I don’t know if any themes surpass “We Will Not Be Forgotten” from the first game, but Wintory’s creative approach to music in a Norse fantasy world is still refreshing and his skill is always a welcomed addition. The game also seems to run more steadily than its predecessor. I remember multiple crashes at inopportune times during my time with The Banner Saga, but the sequel avoids any such problems. Occasionally the health and armor stats would glitch during an attack and not update right away, leaving me to wonder my why my attack didn’t work (then breathe a sigh of relief when I saw it was just taking a moment to update) but that is my largest complaint. 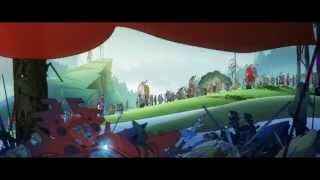 When I got a chance to preview The Banner Saga 2 at E3 last year, I said that the game looked like more of the same. In a way, that’s true. The mechanics are familiar, though there are some new additions, and you feel like you’re returning to a familiar world. The Banner Saga 2’s greatest strength is how it acts in service of a larger story. Its writing superbly takes the characters you came to love in the first game and drags them into dark places. The narrative maintains plenty of mystery while slowly giving you more answers to the strange threat that has put the Dredge at war with the Varl and humans. The Banner Saga continues to be an enthralling experience that I’m desperate to play to conclusion, making the wait for the final chapter seem intolerable. Grab any random screenshot of The Banner Saga 2 and make it your wallpaper. It’s that good. If it isn’t broke, don’t fix it. There’s little differences to The Banner Saga 2, but mostly it feels the same. The biggest difference is that the game feels a little easier, and doesn’t carry the intensity of the first entry. The Banner Saga 2 has a wonderfully written narrative, with great characters and many tough choices to make. There were some glitches during battles, but no crashes. An improvement from the last game. The Banner Saga 2 continues the tale in splendid fashion. It’s dark, beautiful, and impressively written.